Thank you to the publishers for this review copy. Having never read Maggie O’Farrell’s fiction books before I had no idea what to expect from her work (note this is non fiction). Friends had recommended this to me when it came out in hardback – I resisted it, so sure it wouldn’t be for me. 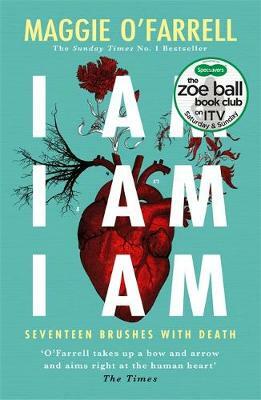 However, I was convinced to read this by Zoe Ball, well ok she didn’t contact me personally but she did select it as part of her summer 2018 book group which is why I gave in and read it! So I started it last night and read it one sitting… Brilliant writing, the pages turn themselves! What a life! I cannot believe that you waited until bl@£dy Zoe Ball put it on her list until you read this! We’ve been banging on about this for ages but I’m glad you got there in the end as it deserves to be read. I love this book, it is captivating from the first page. I highly recommend it.